These chocolate muffins are gooey and delicious on the inside, and easy to make. 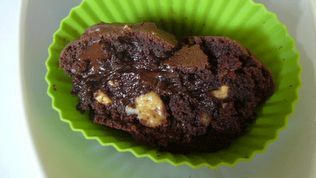 1 - Melt together in double boiler or in microwave the butter and chocolate squares. Let cool. 2 - Mix together the dry ingredients and set aside. 3 - In the largest bowl, mix eggs, sugar, vanilla and coffee, until the mixture is light and has almost doubled in volume. 4 - Add mini chocolate chips and nuts. The mixture will be thick and sticky. Pour into buttered muffin pan. With a wet finger, smooth the top of each muffin. Bake approximately 15 minutes. Do not overcook, the center should remain soft, almost like a chocolate fondant. The technique of toothpicks is not reliable here. It is cooked until the muffin tops are dry and cracked. This makes 6 big muffins.